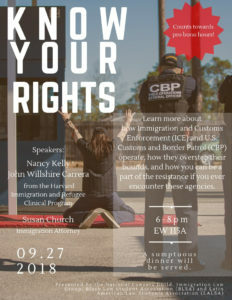 On Thursday, September 27th, at 6:30pm, the NLG-Mass Chapter presented the first Know Your Rights teach-in of our new six-month long series, “Law For The People.” This teach-in, called “Immigration Law For The People,” was graciously held at Boston College School of Law. Speakers Nancy Kelly, John Willshire-Carrera, and Susan Church led the teach-in. individuals as possible to help them secure some of the most basic necessities of life. Church, a law partner at Demissie & Church in Cambridge, was one of the attorneys to first file a challenge against Trump’s Muslim ban. Together, they gave an incredibly informative and emotionally impactful joint lecture on the Trump administration’s unjust inhumane immigration policies, as well as on the aggressive and radical litigation work that many immigration attorneys are conducting against these policies. Although hearing anecdotes about how, exactly, the Trump administration’s policies have devastated the lives of so many immigrant families was necessarily heartbreaking, the lecture concluded on a pragmatic and inspiring note. Kelly, Willshire-Carrera, and Church wisely urged the attending audience, comprised of primarily law students, to collaborate with and support grassroots activists and organizers, as “this is how you build a movement rather than just win a case; this is how you change the law, how you change legal culture” (Willshire-Carrera). All in attendance left the lecture hall visibly inspired. 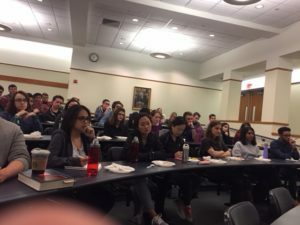 The NLG-Mass Chapter will host a teach-in regarding various legal issues that are pertinent in today’s political climate every month at a different local law school in Greater Boston. These teach-ins are free and open to both legal professionals and the general public. 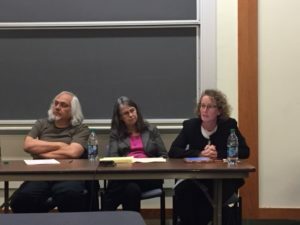 Please visit the “Law For The People” webpage for more information, including featured speakers, locations, topics, and dates – and don’t forget to follow NLG-Mass Chapter on Facebook for constant updates! We hope to see you at the next teach-in!